It’s time to dig in the dirt and enjoy the growth and abundance of Spring!!!! What better way to express your appreciation than to share this Spring Gardening Ensemble with someone! 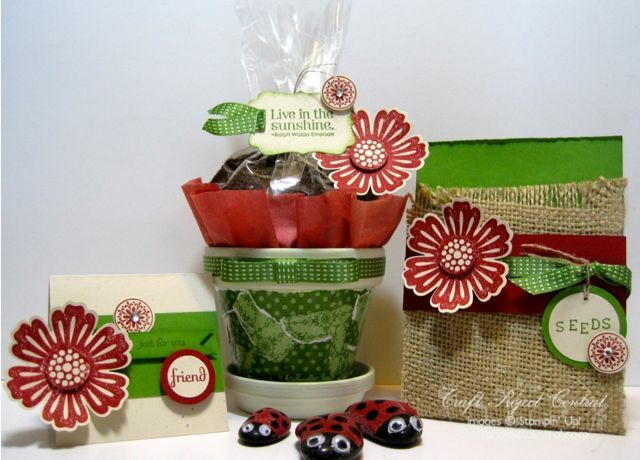 This ensemble features a decoupage clay pot, a burlap seed packet holder, a small gift card and some adorable heat-embossed ladybug rocks to ornament your garden. Any one of these projects, individually, would make for a wonderful small class or stamp camp! This fun and beautiful project was designed by Michelle! If you have a chance head on over to Michelle's blog and let her know how wonderful her project is!